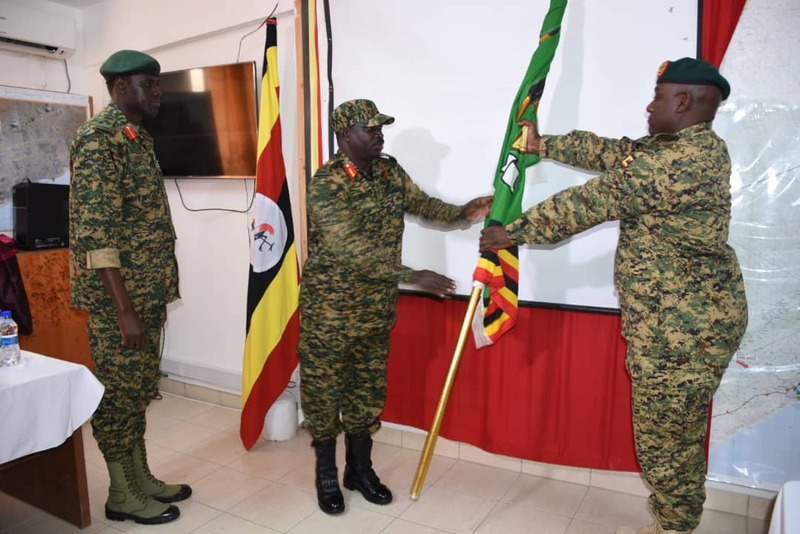 Brig Michael Kabango has taken over as the UPDF contingent commander in Somalia to replace Birg.Paul Lokech who completed his tour of duty recently. The function to inaugurate Brig.Kabango was presided over by the UPDF commander for land forces,Maj.Gen Peter Elwelu. Speaking at the function in Mogadishu, Maj.Gen.Elwelu applauded Brig. Lokech for a job well done during his one-year tour as Uganda Contingent Commander in Somalia. He added that Somalia mission is important not only to Uganda’s ideology of Pan-Africanism but also to the world at large. Gen Elwelu reminded UPDF officers and men operating under AMISOM that “every man on earth has a mission to accomplish”. He noted that before 2007 when Somalia turmoil was at its peak, the country was regarded as a “hell on earth” and whoever suggested to operate or deploy in Somalia was termed as “dead on arrival” but noted that Uganda turned around the situation enabling other countries to deploy their troops. UPDF brigadiers, Lokech and Kabango share a light moment. Brig.Lokech outlined UPDF-AMISOM’s achievements within 2018 including re-occupation of Marka port from Al-Shabaab, the handover of the symbolic Mogadishu National stadium to government, revamping of Barawe and Ceel-jale ports, joint operations between UPDF-AMISOM and various civil military cooperation activities to Somali people. “Civil military activities have made wonders in winning the hearts and minds of the Somali population. As a result, Somalis look at UPDF as a force that is here to help them,”Brig.Lokech noted. 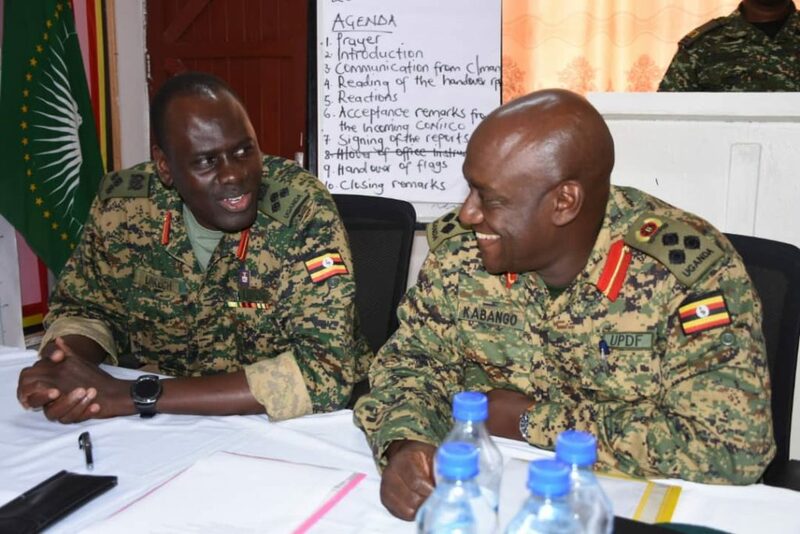 The new contingent commander, Brig Kabango appreciated UPDF leadership for wisdom in appointing him as AMISOM sector one commander adding that he will build on achievements of his predecessors to ensure peace for Somalis. Uganda was the first African country to deploy troops under the African Union Mission in Somalia in 2007 and is currently the largest troop contributor of the 22,000 strong AMISOM force, contributing roughly 80 percent of the number. The Ugandan troops control the largest area in Somalia after being deployed in Sector One in Benadir,(has 16 districts) Banadir, and Lower Shabelle regions having pushed Al Shabaab militants for over 200km away from Mogadishu city. UPDF guards the Somali parliament, airport, UN offices and other key government installations in Somalia.